"Araw ng Kagitingan" April 9 is a holiday. My family and I had a quick getaway at Klir Waterpark Resort in Sta. Rita, Guiguinto, Bulacan. DH hates the horrible traffic at SLEX. He googled "Quick Getaway near Metro Manila" and found several sites suggesting resorts in Bulacan. To my surprise, driving towards NLEX was so much faster because traffic was not as congested. We were at the venue in less than an hour. Klir Waterpark Resort is a 3 hectare land with 4 different kinds of pool. One of them is a 3,500 square meters wave pool- the biggest one in Luzon. The weather was perfect. My daughter spent all afternoon playing with artificial waves and of course, swimming at the Kiddie Pool. She had a lot of fun! The photo above was the only photo we had and it was taken by my mom ; p We were there for a day trip, sad to say, all the cabanas were already rented out. There were no locker rooms available so we only took the basic necessities with us like sunblock, floater and etc. and placed it where we can easily spot it. We left all valuable and everything else in our car. Even the parking lot was already full because we arrived after lunch. DH was able to park right in front of the Ticketing counter which was actually a good thing because we were able to easily get our changing clothes right after swimming and before going to the shower area. The shower area has no shower caddy not even a hook where you can hang your bags. I ended up holding all our changing clothes while waiting for my mom and daughter took turns bathing. It was so inconvenient. As with most of the resorts in Bulacan, guests are allowed and encouraged to bring in food and drinks. The resort has no restaurant but there was a huge hall with tables and chairs provided. 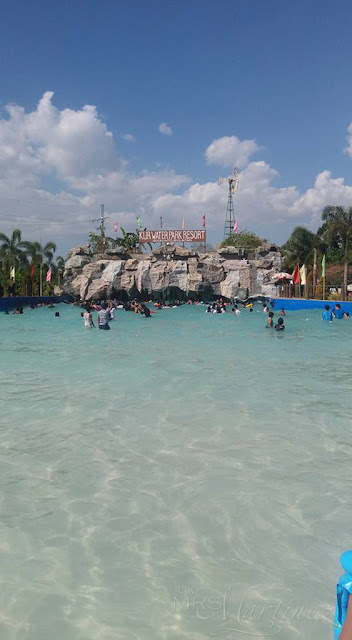 Klir Waterpark Resort is located near at Sta. Rita Exit, Kabilang Bakood, Guiguinto, Bulacan. For cottages and its rates, visit Klir Waterpark Resort. For inquiries, you may call 0925 500 5547, 044 8920227 or 044 760 1075.